Reserve your panoramic vantage point at Central Coast Stadium for the Hyundai A-League 2018/19 season. Located adjacent to the halfway line in the Western Grandstand, platinum member benefit from a bird’s eye view of all the Mariners action in premium allocation reserved seats. Access to all Central Coast Mariners home matches throughout the Hyundai A-League 2018/19 Season. Exclusive member merchandise includes member Cap, Lanyard and Sticker, Key Ring and Fixture Magnet. Access to 2 x Central Coast Mariners away matches vs Newcastle Jets at McDonald Jones Stadium throughout the Hyundai A-League 2018/19 Season in the away bay. Exclusive opportunities to attend Member-Only events including movie nights, training sessions & more. Priority access to Football family pre-sales including finals series (CCM only) and Socceroos. $500 cash back when you purchase a new Hyundai. Visit hyundai.com.au/football for more details. 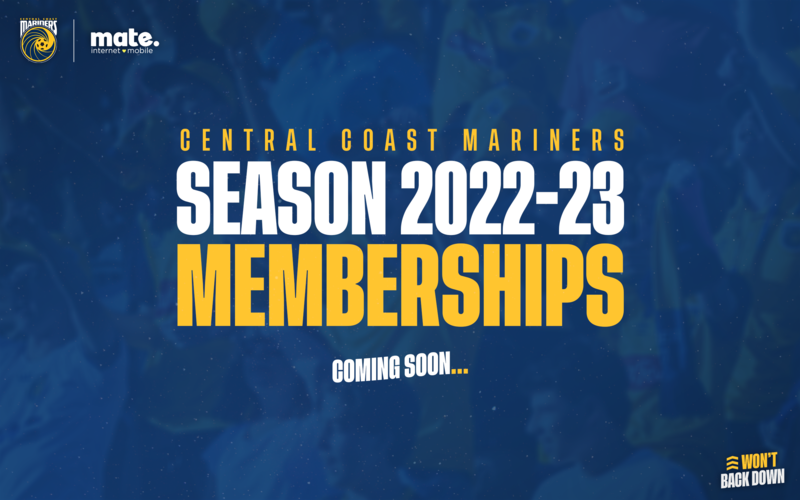 Gold membership lets you lock in your seat for a season full of Mariners action in one of the country’s most picturesque football venues, Central Coast Stadium. Whether you’re an individual, a couple or a family, reserve your seat for the season and enjoy big savings on regular ticket prices as well as a host of additional member benefits. Support your team with the most affordable and flexible Central Coast Mariners Membership. A Navy Membership gives you the flexibility of unreserved general admission seating, allowing you to sit with friends and family during the season and enjoy games together! Watch your Central Coast Mariners take on the league with palm trees in the back drop and an up-field view of all the action. Yellow Membership is a general admission unreserved seating option located in the Northern Stand of Central Coast Stadium, surrounding the active bay 16. For those passionate supporters who like to join in the singing but aren’t quite ready to dive into full active support, Yellow Membership gives you an opportunity to join the excitement. Who do we sing for? We sing for MARINERS! If you enjoy getting loud and proud, Bay 16 is where you need to be. Located centrally behind the goals at the Northern end of Central Coast Stadium, Bay 16 is home to the Yellow Army, the Mariner’s active supporter group. Join the front line of active support and lend your passion to the chanting, flags and colour that bolster our Mariners battle against the opposition. Can’t make every match at Central Coast Stadium? Then this is the Membership for you. Receive access to any six-regular season matches at Central Coast Stadium and enjoy member benefits including savings off regular ticketing prices. Access to 6x Central Coast Mariners home matches throughout the Hyundai A-League 2018/19 Season. Exclusive Member merchandise, Member Cap, Lanyard and Sticker, Key Ring and Fixture Magnet. We understand even the most passionate fans can’t make every game. We don’t want you to miss out on Member benefits which is why our three Game Membership is just for you. Enjoy the flexibility of attending any three-regular season matches at Central Coast Stadium throughout the Hyundai A-League 2018/19 season – the choice is up to you! Access to 3x Central Coast Mariners home matches throughout the Hyundai A-League 2018/19 Season. The perfect option if you’re a Coastie living away from home! Access to 2x Central Coast Mariners home matches and one away match of your choice throughout the Hyundai A-League 2018/19 Season. Do you live overseas and still want to be a part of the Mariners family? This is the Membership for you. Can’t make it to the game? You can still be a part of the Central Coast Mariners family with a Non-Ticketed Membership! Get the great benefits of membership and keep up to date with Members-Only exclusive news. The Central Coast Mariners are proud to announce the Mariners MyClub membership! If you're aged between 4-16 years and are a registered player of Central Coast Football Association, Northern Suburbs Football Association or Western NSW Football, you can get a Mariners MyClub Membership for only $15! Plus, you'll be helping grow grassroots football in your region, as $5 from every membership purchased will go back to support YOUR football club! Access to all Central Coast Mariners home matches at Central Coast Stadium during the Hyundai A-League 2018/19 Season in general admission bays. $5 of your Mariners MyClub Membership goes back to your local clubs. The World's fastest man is coming to the Central Coast! For a limited time only, you can ‘Bolt-On’ this special offer which grants access to all home matches at Central Coast Stadium for the Hyundai A-League 2018/19 season PLUS you can see Usain Bolt take to the pitch against some of the Coast’s brightest talents in our Central Coast Mariners vs. Central Coast Select pre-season fixture on August 31. Tickets included for the pre-season match will be reserved seating. This amazing limited offer which includes 16 games (13 at Central Coast Stadium, two Newcastle Jets away tickets PLUS one trial game at Central Coast Stadium featuring Usain Bolt) Saving over $200 off RRP per adult. Bay 2 of Central Coast Stadium is the designated Alcohol-Free zone for Central Coast Mariners Home matches. Seats can be purchased into this bay through Ticketek. There are no ATMs within Central Coast Stadium. EFTPOS facilities are available at all concession stands, however there is no cash-out option. There is an ATM located outside Central Coast Leagues Club, opposite the Eastern Entry of Central Coast Stadium on Dane Drive. Central Coast Mariners fans are encouraged to gather outside the player exit under the Western Stand post-match for their chance to meet players, take a photo and obtain an autograph. Please note that due to potential post-match commitments, not all players may exit through this area. Adelaide United, Brisbane Roar, Melbourne City, Melbourne Victory (AAMI Park) & Sydney FC - Ticketek 132 849 or www.ticketek.com.au. Perth Glory, Melbourne Victory (Etihad Stadium), Newcastle Jets & Western Sydney Wanderers - Call 13 61 00 or visit here. Wellington Phoenix - visit here. Please note that we also offer Away Day transport and ticket packages for NSW matches. Please visit the ‘Add On’ section for more details. There are Baby Change stations located within the male and female bathrooms at Central Coast Stadium. Click here to view the Terms and Conditions of entry to Central Coast Stadium. Click here to view the Hyundai A-League Terms of Admission. Central Coast Mariners fans are encouraged to be creative and bring along banners and signs to support their team. Please note that banners and signs which display offensive or inappropriate content or unauthorized commercial or promotional content will not be permitted in the stadium. Banner/Flag poles are to be composed or wood or plastic, and cannot exceed 1.5m in length. Oversized Banners (Sized 1000m x 1000m or larger) are required to be pre-registered with the club by contacting us at 02 4353 7200. There are 6 bar areas located on the concourse at Central Coast Stadium, with additional mobile vendors for larger crowds. The number of Bars that are open on match day is determined by Stadium Management. Alcoholic beverages, glass bottles, cans and breakable containers are not permitted to be brought into Central Coast Stadium. Unopened plastic bottled non-alcoholic beverages are permitted. The Central Coast Mariners will be providing 2 x Bring a Mate Flexi Tickets to 2018/19 Members who renew in the Early Bird period. These tickets can be used at any Central Coast Mariners home match (excluding finals series) and can only be used once. These tickets cannot be replaced if they are lost or damaged. TV: All Central Coast Mariners matches are broadcast live on FOX Sports (Subscription TV). SBS TV (free to air TV) also shows selected A-League matches. Check local guides. Radio: Coast FM 96.3 broadcast every Central Coast Mariners match live with the A-Team Football commentary team. ABC Grandstand also takes coverage of all Central Coast Mariners games through their digital channels, with selected matches featured on 92.5 ABC Central Coast. A range of Corporate Hospitality options are available. Contact our Hospitality team on 02 4353 7200 or email corporate@ccmariners.com.au for more information. Limited disabled parking is available at the stadium. If you require a disabled car parking spot, please call the Stadium Management office on (02) 4304 7600 after 11am on the Monday prior to the event you are enquiring about. If you are required to leave a message please leave your contact phone number so your booking can be confirmed and further details can be obtained. Elevators are located on either side of Central Coast Stadium, within a short walk of the Eastern and Western entry gates. Central Coast Mariners Members receive priority access to Hyundai A-League Final Series matches featuring the Mariners. This information will be distributed to members upon qualification for the Finals Series. If you require medical assistance at a match, please visit a venue usher and they will direct you to the closest first aid room. Food outlets are located behind the concourses in both the eastern and western stand. Like bars, the number of open food outlets will be determined by Central Coast Stadium based on anticipated crowd numbers. The Navy (General Admission) western and eastern stands at Central Coast Stadium includes Bays 1 and 2 (Alcohol Free Bay), 11, 12, 20, 21, 22, 23, 24, 25, 26, 27, 28, 29, 30, 44, 45, 46, 52. Yellow (General Admission) Northern stands at the Central Coast Stadium which include Bays 13, 14, 15, 17, 18 and 19. All Junior Membership holders must be aged 16 and under at the time as at 1 March 2018. Children aged 4 years and under on match day will be admitted free to Central Coast Mariners home matches at Central Coast Stadium, but are required to sit on the knee of their parent/guardian. Any children aged 3 and under who require a seat, will need to purchase a Junior Membership/Ticket. On match days, please take any lost property including lost Membership cards to the Central Coast Stadium event office, located under the western stand. If you have lost something at the match, please call the stadium on 4304 7600 during office hours. If you forget to bring your Membership card to the game, visit the Mariners collection window in the Central Coast Stadium Ticketek Box Office (Western side, under Brian McGowan Bridge) to be issued with an access ticket to the match. If your Membership card has been lost or stolen, please contact the Central Coast Mariners during business hours to arrange for a new card ($10 for first replacement card, $50 per card thereafter). If you purchased a ticket to an individual Mariners game and it becomes lost or stolen, please contact 132 849 or visit the Central Coast Stadium Ticketek box office. Registered footballers aged 4-16 years, playing in the Central Coast Football, Northern Suburbs Football Association or Western NSW Football Regions are eligible to purchase a “Mariners MyClub” Membership, which allows access to general admission bays for all home games at Central Coast Stadium. For more information on Mariners MyClub Membership go to the packages section. Existing members: when renewing online, ensure you log in using the details supplied in order to maintain your current membership number. New members: membership numbers are automatically allocated once your membership is processed. Central Coast Mariners merchandise is available at all home games and at Erina Rebel Sport store. All 2018/19 Central Coast Mariners receive a 10% discount on merchandise online, at the home matches and the Erina Fair Rebel store. The first instalment of a monthly payment plan must be paid upon purchase of the membership. Instalments are deducted from your nominated card every 30 days up until 30th March 2019 when all Memberships are required to be fully financial. Should the Member have more than a month’s payment owing on 30th March 2019, the total outstanding amount will be deducted. The monthly installments option is available to make it more convenient and affordable for you to pay your 2018/19 Membership. One off administration fee of $5.00 will be added to your Membership Fee, deducted monthly ($5.00 total, $0.83c monthly over 6 months). The Club reserves the right to process any outstanding installments within a 30 day period from the time of a rejected installment with no notification to the Member. If a payment is missed, you will be charged an additional $10.00 for each month a payment is missed. If your credit card details change, it is the responsibility of the purchaser to inform the Club’s Membership Team on 02 4353 7200 or memberships@ccmariners.com.au. The club will not be held responsible for any additional fees incurred due to expired or cancelled credit cards. The Central Coast Mariners Official Supporters Club provides an officially recognized link between Central Coast Mariners fans and the club. Find out more about what the CCMOSC do and how you can join at www.ccmosc.com.au. Disabled parking can be arranged from 11am each Monday prior to a home game by calling Central Coast Stadium on 4304 7600. Parking at the Central Coast Leagues Club (opposite the stadium) is restricted to members of the Leagues Club on match days. For details contact 4325 9888. Free general public parking is available in the Old Gosford Town Centre Building (access via Albany Street) and the Gosford Railway Commuter car park on Showground Road. If utilizing roadside parking, please obey all signage and be mindful of business and resident access. Pass outs are available at Central Coast Stadium via both main entry gates. Pass outs are available only until 15 minutes after halftime. Rail: the nearest station to Central Coast Stadium is Gosford, approximately 500m walk from the main Eastern gates. Bus: the nearest stop is on Mann Street opposite St George Bank. For train and bus timetable and fare information, visit Transport Info NSW. Ferry: Central Coast Ferries also operate the “Ferry to the Football” for selected games – visit www.centralcoastferries.com.au for more information. Restrooms, including disabled stalls are available throughout the venue at Central Coast Stadium, on the concourses behind both the Eastern and Western Stands, as well as inside the main eastern gates. Existing 2017/18 Platinum and Gold Central Coast Mariners members will have the first right to renew their reserved seat for the 2018-19 Season . This will be in place from the 30th April until 15th June 18. Existing 2017/18 Platinum and Gold Central Coast Mariners Members wishing to change their allocated seats can fill out the appropriate form during the renewal process. Seating requests will be assessed chronologically based on the earliest requests being received. Any un-renewed seats after 25th June 2018 will be released and made available to any existing 2018/19 Members requesting a seat change, or new members purchasing a reserved seat 25th June 2018. If you are looking to purchase seats adjacent to friends or family, we recommend submitting all membership forms/renewals together or in the same transaction, ensuring you fill out the seating allocations form clearly. If you are purchasing or renewing as an individual, please ensure you state the full name and member number (if known) of the person you wish to be seated near. Please note: while our membership team do their best to accommodate all seating requests, there is high demand for our reserved area and we are not always able to meet these requests. Any changes to seating allocations after the initial deadline must be made direct to the club, and are subject to availability. These changes may incur an administration cost and/or card re-printing fee. To view membership seating plans for Central Coast Stadium, please click here. Central Coast Stadium is a non-smoking venue. Those wishing to smoke during the match must obtain a pass-out via either the eastern or western gate. Central Coast Stadium has a stroller cloaking area underneath the grandstand. Please see VIPeople staff (blue jackets) upon entry to the ground. Local taxi’s can be booked by calling 131 008. Please note there are several road closures in and around Central Coast Stadium both before and after Central Coast Mariners fixtures. To purchase individual tickets to a Central Coast Mariners match, visit here, call 132 849 or visit any Ticketek outlet during business hours. Umbrellas may be brought into Central Coast Stadium, but should not be put up if they obstruct the view of others. While most Central Coast Mariners matches are played in fine summer conditions at Central Coast Stadium, the odd rain event may affect match-day. The club will communicate to members any changes or alterations to match days when appropriate. If you require wheelchair seating to individual matches, please call Ticketek on 132 849 to secure suitable tickets at Central Coast Stadium. For Membership seating with special requirements, please contact the Central Coast Mariners on 1300 767 442. The Mariners acknowledge the Companion Card Program and we agree to provide an admission ticket or equivalent membership for the cardholder’s companion at no charge. For more information on disabled services at Central Coast Stadium, contact the stadium directly on 4304 7600. Our active supporter group is located in Bay 16 in the Northern stand and are known as the Yellow Army. The Yellow Army supporter bay is the hub for noise, banners and flags. This means that at some points before, during and after the match your vision may be obstructed. Supporters in this area chant, sing and stand throughout the match. If you do not wish to take part in those activities, it is recommended that you choose your seat elsewhere in the stadium, although we fully encourage supporters to get involved! You can find out more information by visiting the Yellow Army Facebook page – www.facebook.com/yellowarmy.net. The completed membership application form (Form) and these terms (including any incorporated terms) form a valid, binding and enforceable legal agreement (Agreement) between the person named on the Form (you) and the Central Coast Mariners Football Club [ABN 84 618 563 134] (Club). By ordering a membership of the Club you expressly agree to be bound by and comply with these terms, and all applicable laws and regulations. If you are successful in your application for membership, the Club will send you an acceptance letter confirming your membership and membership benefits. Club will not process any Form which is incomplete. Club reserves the right to not accept any Form in its absolute discretion. Central Coast Mariners Football Club 2017/18 Membership holders have an exclusive renewal period until 5:00pm AEST on Friday 22 June 2018. After this date, any seats not renewed will be released and made available for purchase to existing Members who wish to upgrade or new Members purchasing a new Membership. Seat location will be determined at the time of purchase and is not subject to change at any time. New Members may purchase Memberships in the Early Bird Period (4th June 2018 – 5:00pm 22nd June 2018) however those purchasing Reserved Seating will not have confirmation of their seating request until Monday 2nd July 2018. Existing 2017/18 Members hold priority on seating availability. All prices included in the Membership brochure and website are inclusive of GST. Prices exclude any processing, shipping or additional credit card fees. You will be entitled to the Club Membership benefits in the category applied and paid for. Club Membership does not entitle you to any other right except as expressly set out in these terms and conditions. Specifically, a Club Membership does not entitle you to entry into Finals Series fixtures or FFA Cup fixtures; however wherever possible you will have priority booking rights for such fixtures. Club Membership does not give you the right to attend or vote in any meeting of the Club or to participate in any dividend entitlement of any nature whatsoever. Club Memberships expire on 31 May of each year. You will receive first right to renew your Club Membership. Seat locations are subject to availability and will be determined at the time of purchase. Club Membership card must be presented at entry at each home fixture game to gain entry to the venue. All Members must take responsibility for updating all personal details by either using their personal log-in to our Membership portal, contacting the club on 02 4353 7200 or by email memberships@ccmariners.com.au. The Club communicates to Members via e-mail and holds no responsibility for Members not receiving any communications due to the purchaser's failure to update their personal details. Replacement of any lost, stolen and damaged Membership card will incur a cost of $10.00 for the first re-issue. Should you require a card to be re-issued a second time, an administration fee of $50.00 incurred. These Membership cards will be immediately cancelled (within the next business day) and new cards issued within 7 working days. Should the replacement card not be available for the next home game, the Club will issue a temporary pass for the card holder. Junior Memberships, the child component of a Family Membership, and Mariners MyClub Memberships, apply to persons aged 16 and under at the time of purchasing. Children aged 3 and under at the time of purchase are admitted free if they sit on the knee of an adult, however if they take up a seat they must pay the applicable junior rate. Student Memberships apply to secondary (high school) students aged 17 and over who hold a valid secondary (high school) or tertiary (TAFE for high school purposes) student card at the time of purchasing. Valid Student ID may be requested upon application of this Membership. Concession Memberships applies to Australian Aged Pension, Seniors Card, Disability Pension card holders (carer is admitted free of charge with purchase of wheelchair seating only). The Club also accepts the Companion card and Full Time tertiary students (TAFE, University) with valid photo Student ID. Proof of eligibility for concession and high school students must be available for display on entry into the venue, at point of sale and point of collection, or season tickets and/or game day tickets can be cancelled. Members wishing to sit within an organized active supporter group must purchase a Yellow Army Membership situated in the dedicated reserved seating area. Membership cards are transferrable, and will allow entry to patrons regardless of the printed name on the card. However each ticket will only permit one (1) entry per match. Adults and Concession holders may not enter on a child’s Membership card. Adults may not enter on a Concession’s Membership card. Memberships are to be paid in full by the various payment options or 6 x monthly instalments via our payment plan options provided a valid credit card number is supplied. The first instalment of a monthly payment plan must be paid upon purchase of the membership. Instalments are deducted from your nominated card every 30 days up until 30th March 2019 when all Memberships are required to be fully financial. Should the Member have more than a month’s payment owing on 30th March 2019, the total outstanding amount will be deducted. The monthly instalments option is available to make it more convenient and affordable for you to pay your 2018/19 Membership. An administration fee of $5.00 will be added to your Membership Fee, deducted monthly ($5.00 total, 0.83c monthly over 6 months). The Club reserves the right to process any outstanding instalments within a 30 day period from the time of a rejected instalment with no notification to the Member. If a payment is missed, you will be charged an additional $10.00 for each month a payment is missed. If your credit card details change, it is the responsibility of the purchaser to inform the Club’s Membership Team on 02 4353 7200 or memberships@ccmariners.com.au. The club will not be held responsible for any additional fees incurred due to expired or cancelled credit cards. The Club reserves the right to immediately suspend or cancel a Membership at any time if, in the opinion of the Club, a Member engages in disruptive behaviour or serious misuse of their Membership card. Continued failure to make payments may result in the temporary suspension or cancellation of your membership. the rules and regulations of the venue at which a Match is played, including terms of entry and any restricted or prohibited items. not to bundle it with other goods or services, without the Club’s prior written consent. If this condition is breached, the Club may, in addition to any other remedy and even if the holder of the Ticket did not have notice of the condition or the breach, deny the holder admission to the Match and retain the price of the Ticket. You must comply with FFA’s Terms of Admission (available at www.footballaustralia.com.au) and must not enter the playing enclosure of a venue at any time and, if you do, you may be fined, expelled from the venue or banned from attending further Matches and subject to legal action. Nothing in this clause 4.1 affects your rights under the Competition and Consumer Act 2010 (Cth) or similar legislation under which the Club’s liability may not be excluded, restricted or modified by private agreement (Consumer Law Rights). any tort committed by the Club (including negligence but not including fraud), the Club’s liability to you is limited (at the Club’s election) to the Club repaying any amounts paid by you under this Agreement or supplying or resupplying any Tickets to which you are entitled in accordance with the terms of this Agreement. Once your Form is sent to the Club you cannot cancel your membership and, without limiting clause 4, refunds and exchanges are allowed only as expressed in this Agreement. you are entitled to a refund by virtue of the operation of Consumer Law Rights. provided you contact the relevant call centre number or website, within a reasonable period of time before the rescheduled Match. the time of, or teams participating in, a Match changes after the date you purchased your Ticket. the Club disclaims the existence of any common law duty of care to you and any holder of the ticket. The Club will not replace your Ticket, if lost, stolen, forgotten, damaged, forged or unreadable. Club reserves the right to cancel membership at any time if, in Club’s opinion, a member engages in disruptive behaviour which is deemed prejudicial, or likely to be prejudicial, to the interests or reputation to the game, Club, FFA, or any of their sponsors. Disruptive behaviour may include any attempted or actual act or omission by a person that constitutes a breach of the Terms of Admission, Stadium Conditions of Entry or Spectator Code of Behaviour; or behaviour that jeopardises, or has the potential to jeopardise, the safety or security of a Match. The Club may choose not to enforce a term of this Agreement in some cases in its absolute discretion without affecting its right to enforce that term in other cases, including by replacing tickets (except forged tickets) if you can demonstrate proof or purchase and identity acceptable to the Club. All dates, times, participating teams and venues of Matches are as specified on the www.footballaustralia.com.au from time to time and may change without notice to you. is the entire agreement between Club and you in respect of its subject matter (subject to clause 4.1) and supersedes any prior agreement, representation or promotional material. FFA means Football Federation Australia Limited ABN 28 106 478 068, which is the national governing body of Football in Australia. Hyundai A-League means the national club competition to be staged by FFA from 2005 to be known as the Hyundai A-League (or a name as otherwise notified by FFA). Mailing Address means the mailing address as nominated by you on your Form or as varied by written notification to the Club. Match means a match in the Hyundai A-League in which the Club’s team participates in at the date, time and venue and against the opposing team as specified on www.footballaustralia.com.au from time to time, but excludes the Finals Series and any other match, competition or tournament staged or sanctioned by FFA. Tickets mean any ticket allocations to Matches that form part of the membership benefits. Member Benefits mean Central Coast Mariners FC Member-Only newsletters, access to Members events, Membership merchandise included in your specified Members package, Man of the Match voting rights and priority access to Finals Series Matches involving the Central Coast Mariners. Platinum Membership mean season ticket to all Central Coast Mariners FC home matches at Central Coast Stadium, in a Platinum reserved seat. Yellow Army Membership mean season ticket to all Central Coast Mariners FC Home matches at Central Coast Stadium in a Yellow Army reserved seat in Bay 16. 6 Game Membership mean entry to 6 Central Coast Mariners FC Home matches at Central Coast Stadium of your choice in a Navy or Yellow General Admission designated area. 3 Game Membership mean entry to 3 Central Coast Mariners FC Home matches at Central Coast Stadium of your choice in a Navy or Yellow General Admission designated area. Non Ticketed Membership means no entry to Central Coast Mariners FC Home matches, however receive benefits as outlined in the membership package. International Membership means no entry to Central Coast Mariners FC Home matches, however receive benefits as outlined in the membership package. Home & Away Membership means entry to one (1) Central Coast Mariners FC Home match at Central Coast Stadium, and entry to two (2) Central Coast Mariners away matches and receive benefits as outlined in the membership package. In the event of the venue reaching full capacity, the Central Coast Mariners reserve the right to refuse the use of Bring a Friend for Free vouchers on match day. The Central Coast Mariners will contact Members in the lead up to match day if the venue reaches capacity. In order for the Bring a Friend for Free voucher to be redeemed, the contact details of the guest must be completed. The Central Coast Mariners reserve the right to refund or return any Add-On purchases made by Non-Members, as these are exclusive benefits to paid Members only. Two (2) Complimentary Beverages are provided – Proof of ID is required for anyone over 18 wishing to consume alcohol. Soft Drink and Water also provided. Travellers are required to arrive at the departure venue on time, as the bus will not wait for late comers. If you foresee any issues, you must contact the Central Coast Mariners on 02 4353 7200. Includes bus transport and entry tickets to 3 x NSW Away Games (Sydney FC, Newcastle Jets or Western Sydney Wanderers). Includes 1 x Premium Ticket to a premium Central Coast Mariners home match (Date TBA) in a Corporate Suite, including food and beverage. VIP Stadium Tour will take place on this match day also. Dress Codes apply for Corporate Suites. Please contact the club for further details regarding dress code. Central Coast Mariners Home Jersey restricted to sizing Small – 3XL in Mens, and Size 8 – 16 in Womens. Childs Jerseys available on request, pending availability. For contacting the various Central Coast Mariners FC departments (e.g. sponsorship, media, events) please e-mail info@ccmariners.com.au and place your enquiry information in the subject line. If you want to contact the club for issues other than Membership please visit ccmariners.com.au for further details. Refer a Member as part of our Mariner Get Mariners program, and our best recruiter of 2018/19 will win a fantastic prize! How do you go in the draw? It’s easy! When your friend or family member signs up, make sure they add in your name and contact details in the required field. The Members who recruit the most will be rewarded with great Mariners prizes! Match Round & Date of trip is TBC, pending draw release. Sign up 1-4 new Mariners Members and you’ll receive a personal invitation to attend an exclusive Mariner Get Mariner team training session. Sign up 5 or more new Mariners Members and you’ll be able to take part in a 2018/19 photo with the Central Coast Mariners team. Terms & Conditions Apply. Click here to view full terms & conditions. Referred Members must be new, and not renewing Members of the 2017/18 season. Referred Members must complete the required fields in order for the submission to be valid.